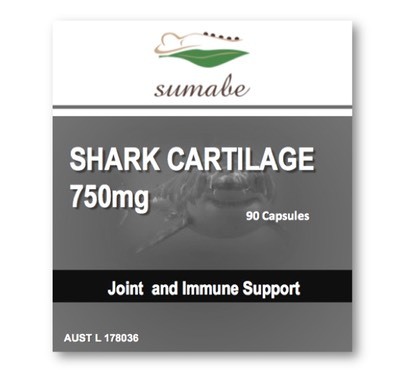 Sumabe® Shark Cartilage has been reported to have analgesic and anti-inflammatory activities, which may assist in reducing pain and inflammation of the joints. It helps to maintain healthy joint function and supports and maintains healthy immune function. Shark Cartilage 750mg may assist in the maintenance of general wellbeing. Adults: Take 1-2 capsules daily, with meals, or as directed by your healthcare professional. Shark cartilage has been reported to have analgesic and anti-inflammatory activities, which may assist in reducing pain and inflammation of the joints.